This was the second time my son and I attended the ASP Autism Family Prayer Jamboree on World Autism Awareness Day. Last year, my entire family attended. 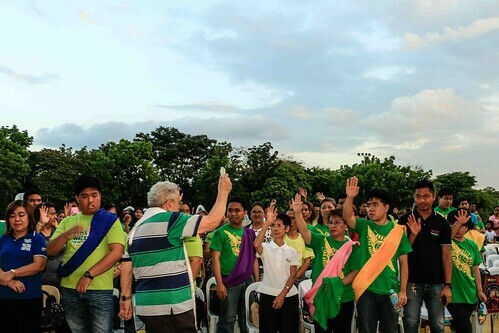 I was slightly surprised and happy to know that this event existed, and that families of persons with autism were to be prayed over and blessed in an ecumenical gathering. I thought the venue was brilliant! Quezon Memorial Circle is the perfect place for kids to romp around and explore, while the adults can sit or walk lazily about. There are plenty to see and buy from the vendors, with the breeze and the trees cooling us down. Since April is the start of summer, the 4:00 pm program was also ideal. We watched the performers rehearse onstage and then there was the program proper. The audience became excited with the songs and performances. Parents clapped and cheered seeing their children perform. There was variety and balance in the performances, we did not become bored. The emcee this year spoke in Filipino and connected. But what riveted us and touched our hearts were the prayers from the various ministers and priests. I think it was consoling and gratifying to know that these people share our burdens and fears. There are people who understand us. We became conscious that we belong. Hearing these men and women of God lifting our cares heavenward choked us. One minister read from the Bible about Jesus letting the little children come to Him. As the families were being blessed, we can almost feel an invisible hope and strength. God is with us in our daily struggles to understand our children with autism. Our hardship in living with persons with autism is our charism, our mission in life. Maybe this is our family’s contribution in making the earth more Christ-like. We gained a deep peace and spirituality in accepting this truth. The colossal Quezon City Memorial Monument was lit up in blue at 7:00 pm. The countdown felt anticlimactic. The real event were the blessing and prayers. The pretty blue lights seemed symbolic of the awakened flame of hope and spiritual strength in our hearts. I thank the organizers for this remarkable event - they were even thoughtful enough to know how famished we were and provided food! No wonder my son never forgets and looks forward to the next World Autism Awareness Day! About the contributor. Mary Aileen S. Valera is a homemaker, educator and a member of Kaakibat ng Autism Society Phililippines Multi-purpose Cooperative (KASPI-MPC). She teaches Values at a public high school and observes little difference between kids on and off the spectrum. She is a mother to four children and her third son, Rupert is on the spectrum.